A great piece of that oft over-used category, Folk Art. 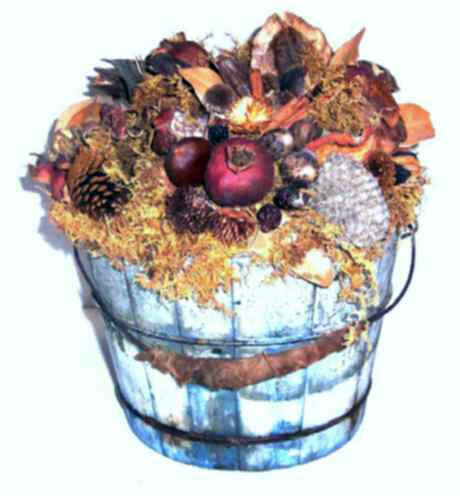 A wire banded hand constructed water bucket becomes the basis for a wonderfully complex arrangement of dried flora. The bucket itself of mid 1800's (or earlier) vintage was originally a soft Mustard color (see the bottom), then over-painted in Green and finally a great Robin's Egg Blue that has weathered to a specially soft group of light grays and equally soft blues. Don't be put off by the picture which shows the colors too bright. It really is lovely. The wire bail handle retains an original cloth wrapping that enhances the overall appeal. As a piece of unusual decor, it's in the "BEST" rank . . . truly special. Size is 10" tall and 11" in diameter.